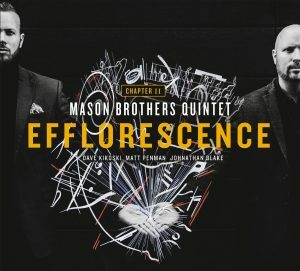 Originally from Norwich, England, Elliot Mason, has become a powerful voice on both the bass trumpet and trombone throughout the jazz community both stateside and the world. His virtuosic technique and sound stand out as an accented beat away from the path most travel. From early on in his career, he knew this is what he wanted to do. By the age of twelve he was gigging regularly throughout London and at the ripe age of sixteen he joined his brother at Berklee School of Music. Once graduated, the New York Jazz Scene didn’t take long to learn his name. 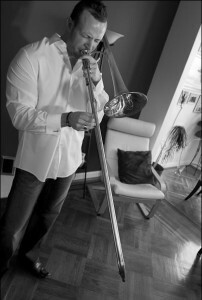 Soon after he became a member of the Jazz at Lincoln Center Orchestra and joined Northwestern University in Chicago, Illinois as the jazz trombone instructor. As an educator, top-field performer and diverse voice, Elliot’s style is refined and in demand. His vocalizations speak of Woody Shaw & John Coltrane on the Bass Trumpet and yet this ability is easily transferred on the trombone. An amazing feat to accomplish on any instrument, there’s a talent that’s distinct and powerful and as unique as his choice in horns. But it’s his passion to play and write that drives this man to stay in the groove while telling his story to the world. My father was a music educator who played trumpet, trombone and bass trumpet. My mom was a jazz vocalist, who sang while pregnant with me, so you could say I started listening to jazz at a very early age. The amount of time I spent listening to and playing jazz with my father was also integral to my musical development. At the age of 16, I came to the United States to study at Berklee College of Music. My brother Brad, a trumpeter, had already been in the U.S. for two years, so my parents were comfortable sending their youngest son there. I’ve been here ever since. I began on trumpet at age 4, but my father thought my embouchure was better suited for trombone. Eventually I reestablished my connection with the valves, and after a lot of perseverance, I felt equally fluent in both instruments. Now I go through phases with the horns. There are times when I’m consumed with the bass trumpet, and it’s hard for me to put it down and pick up the slide, and vice-versa— either way, I try to practice both everyday. I feel as if I’m missing an opportunity to improve if I miss a day of practice. The essence of who I am is distilled when I solo. Everyone has a distinctive sound of their own, but practice is crucial in that sound’s expression. As a musician you spend an infinite amount of time playing and practicing alone so you can find out a great deal about yourself. When I first began developing my musical vocabulary I immersed myself in the work of jazz greats, trying to absorb my influences instead of imitating them. I soon gravitated towards working on my own voice and my own form of self-expression. What helps me to continually evolve is to routinely examine my motives and priorities. What’s important to me in life can have great impact on the direction my playing takes. Recently, with the increased time I spend on the road, I may have only an hour to practice everyday. When I come home from touring, I devote a good amount of time to making sense of the music within. I’ve spent the last 15 years balancing the study of tradition while keeping true to my own voice. I’m maturing, definitely. Lately I have been concentrating on my overall consciousness of being in the moment. To me, it’s more about how you tell the story. The delivery is as important as the content, and this is clearly reflected in the work of jazz masters. It’s upsetting to think that some people of my generation and later don’t even know what instrumental music is. Everyone loves songs with vocals because they seem easier to understand. Jazz, on the other hand, doesn’t always need lyrics. A musician with intent behind his solo can talk to you, even if you don’t speak the language. When it hits you, you will understand the depth of the art form. I have a huge passion for this art form and that fuels me. Jazz is an immense part of me and my life. This is a musical language of expression; it can move us, capable of making us laugh, scream and cry all within 12 bars. Let your own experiences and wisdom tell your story for you. Tagged Arranger, Bass Trumpet, Berklee School of Music, Brad Mason, Composer, Educator, Elliot Mason, England, interview, Jazz at Lincoln Center Orchestra, John Coltrane, London, Norwich, Trombone, Woody Shaw. just found your website whilst googling your Dad! He taught me for a while when he worked for Norfolk County Music Services, I remember his patience (he needed patience with us in Dereham) & his bass trumpet. An amazing musician & a lovely human being. Thanks for keeping the musical faith!